All ordinary matter in the Universe (not including “Dark Matter”) is composed of chemical elements. It was not until 150 years ago today (on 1869 February 17) that a logical classification system was developed for chemical elements: The Periodic Table of Chemical Elements. 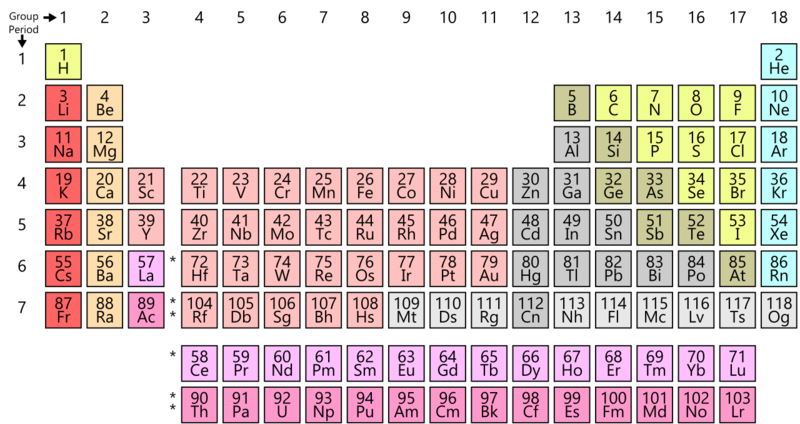 While British, French, and German scientists had earlier attempted to develop systems to organize the then-known elements, it was a Russian professor of chemistry, Dimitri Ivanovich Mendeleev, who created this first comprehensive representation of elemental reality, which classified the then-known 63 elements in order of atomic weight. And, unlike earlier systems, Professor Mendeleev did something unprecedented with his Table. He left spaces in his Table for elements, with predicted atomic masses and chemical properties, which had yet to be discovered! The development of the Periodic Table of Chemical Elements is an interesting story, showing the eccentricity and obsession of Professor Mendeleev. After conducting research in Europe, in 1861 Dimitri Mendeleev returned to Russia and later began teaching chemistry at the Saint Petersburg Technical Institute. Realizing that there was no current textbook on organic chemistry, he wrote his first book, Organic Chemistry, in 1861. This was considered one of the most authoritative books on the subject in the middle of the 19th century. Although only 27 years-old at the time, he had a long flowing beard and disheveled hair (only cut once a year), looking much like the stereotypical, eccentric scientist, long before Albert Einstein made the look popular. But, it is reported that he was popular with his students. proportions of the various parts. According to a Khan Academy on-line course article, Professor Mendeleev actually developed his first Periodic Table from a dream he had experienced! In 1867, Professor Mendeleev started writing a second chemistry book concentrating on inorganic chemistry. This book, Principles of Chemistry (in two volumes), also became a standard text for the field, for several decades. With the writing of this book, he started concentrating on finding a way to classify elements. While he tried to use the two organizing systems common at that time, organizing by atomic mass or by chemical properties, he found neither way as satisfying. Then, he hit on a new system which combined both original systems into a single framework. This single framework was his breakthrough. And, it seems this system was inspired by the card-game “Solitaire”! Solitaire arranges game-cards both by suit, horizontally, and by number, vertically. Professor Mendeleev created 63 cards, one for each of the known elements at the time. Then, he started rearranging the cards by atomic mass and by chemical properties. He spent a great deal of time, wherever he was, organizing and re-organizing the 63 cards. On 1869 February 17, he again started rearranging the cards after breakfast, and before he had to leave to catch a train. Well, he completely forgot about catching the train, and continued working on the project for three days. After testing-out many different sequences for the cards, he suddenly realized that there were gaps in the order of atomic mass. He called his discovery the Periodic Table of the Elements. This was due to his discovery of the “Periodic Law,” as he found that when the elements were arranged in order of increasing atomic mass, elements with similar chemical properties recurred at regular intervals, or periodically, on his chart. Actually, his original Table did not completely use atomic mass as the organizing principle; there were exceptions. Professor Mendeleev did not realize it, but he had actually organized this Table by “Atomic Number,” which is the number of positively-charged protons in the atom (and negatively-charged electrons which orbit the atom). This periodicity, of the elements listed by ascending Atomic Number, comes directly from the periodic repeating of similar electron configurations in the outer shells of their respective atoms. Professor Mendeleev went further by using the patterns he found in his Table to predict the properties of elements which had not yet been discovered. He left blank spots as place-holders in his Table, for the missing elements for which he was predicting their existence. Professor Mendeleev's first Periodic Table of the Elements was presented to, and published by, the Russian Chemical Society on 1869 March 6. He continued working on the Table, publishing improved Tables, including one in 1871. Professor Mendeleev's Periodic Table of the Elements was not immediately accepted by other scientists. However within 20 years, three of the “missing” elements which his Table predicted were discovered: Gallium (1875), Scandium (1879), and Germanium (1886); and they all included the basic chemical characteristics that Professor Mendeleev had predicted. The Periodic Table of the Elements then began to be accepted by the scientific community. As with much of science, several scientists were also developing the idea of organizing the elements in some way. In 1787, the first list of the then-known 33 elements was produced by French chemist Antoine Lavoisier, working with Antoine Fourcroy, Louis-Bernard Guyton de Morveau and Claude-Louis Berthollet. In 1817, German chemist Johann Döbereiner noticed that, when the elements' properties are considered, they could be placed in groups of three. In 1857, French chemist Jean-Baptiste-André Dumas tried to organize the elements, mathematically, based on atomic weight. On 1863 February 7, British chemist John Newlands published a Table of the Elements. He also found that there was periodicity in the atomic mass of the elements and their chemical properties. However, John Newlands' Table of the Elements was not well received by the scientific community, and he did not pursue further research in the area. Although his Table did not accurately predict the characteristics of future to-be-discovered elements, he may be the first person to recognize periodicity among the elements, even though he had trouble clearly identifying it. In 1870, German chemist Julius Lothar Meyer published a paper describing a Table of the Elements similar to the one described by Professor Mendeleev, but a year later. It was probably Professor Mendeleev's confidence in the “place-holder” elements' predicted properties that made his Periodic Table of the Elements the most accepted. National Periodic Table Day is celebrated each year on February 7, as English analytical chemist John Newlands published his Table of the Elements on 1863 February 7. This unofficial, national holiday was created and publicized by a chemistry teacher in the Jefferson County Public Schools in Kentucky, David T. Steineker. An interesting coincidence is that Dimitri Mendeleev's 1834 birth-date, as dated in the Western Hemisphere, was also February 7. At his birth-home in western Siberia, the date would have been February 8 as determined by the Gregorian Calendar. However, at this time Russia was still using the Julian Calendar (known as Old System or O.S. ); by the Old System his birth-date was recognized as January 27. And, due to this year's 150th anniversary of the Periodic Table of Chemical Elements, on 2017 December 20 the United Nations General Assembly proclaimed the year 2019 as the International Year of the Periodic Table of Chemical Elements. Khan Academy. "Periodic Table of Elements." Crash Course Chemistry On-Line Student Course. Khan Academy. "Dmitri Mendeleev." Crash Course Chemistry On-Line Student Course. Scerri, Eric R. "The Evolution of the Periodic System." Scientific American 2011 Jan. 21. 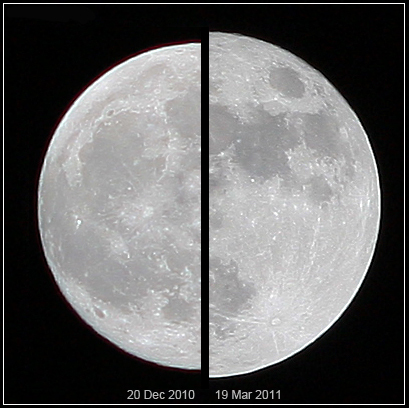 Comparison of a Lunar Perigee Full Moon, a so-called "Super-Moon," of 2011 March 19 and an average-sized Full Moon of 2010 December 20, both as viewed from Earth. This month's Full Moon (Snow Moon), which occurs on Tuesday, February 19 at 10:53 a.m. EST / 15:53 UTC, will be the largest and closest Full Moon of 2019 (and, hence, considered by some a so-called "Super-Moon"), due to a Lunar Perigee (distance from Earth: 221,681 statute miles / 356,761 kilometers) on February 19 at 4:00 a.m. EST / 9:00 UTC. Most Native Americans in the Northern Hemisphere referred to the February Full Moon as the Snow Moon for obvious reasons. Other Native American tribes have called the February Full Moon the Hunger Moon, due to the difficult hunting conditions during the harsh weather of the month. Once every 19 years (including February of last year), February has no Full Moon (then, both January and March of that year have a "Blue Moon," the second of two Full Moon phases in one calendar month). This is due to the fact that February has only 28 days (29 days once every four years during the Leap Year) while the time duration of the Moon's orbit around the Earth is even shorter: 27.32166 days. The Full Moon is visible, weather-permitting, the night of Full Moon and the nights before and after the night of Full Moon, approximately local sunset to local sunrise. "Astro-Calendar: Jan. / Pix of NASA Fly-By of Ultima Thule." 2019 Jan. 2.